Vanpools run Monday through Friday. Time schedules vary. OC Vanpool at UCI is a convenient alternative form of transportation available to staff, faculty, and currently enrolled UC Irvine students. Vanpools are month-to-month "super carpools", subsidized in part by OCTA, and operated through the third-party vanpool provider, "Commute with Enterprise". The goal of the program is to reduce the number of single occupant vehicle trips made to campus by faculty, staff, and students. This convenient program supports California clean-air mandates, reduces campus and community congestion, and conserves and enhances campus resources. In addition, vanpooling saves time by allowing use of the carpool lanes, reduces your carbon footprint, and has health benefits including reduced stress. Vanpool passengers can use the time they would have spent driving to relax, sleep, email, text, and read. "Commute with Enterprise" vehicles feature luxury upholstery, sound system, cruise control, power locks, and windows, and front and rear A/C, with additional upgrades available. Vehicles range from minivans, sport utility vehicles, and transit vans. Riders split the cost of fuel and the vanpool rental rate, which is established by "Commute with Enterprise" and varies by type of vehicle and monthly mileage. The vehicles are fully insured and maintained by the vanpool provider. Full-Time Riders: Most vanpoolers pay a monthly rate from $85 - $200. Standby Riders: Only $15 per day for campus faculty, staff, and students. If you ride more than 8 days in one calendar month, the passenger pays the full rate. What is a vanpool and who drives? 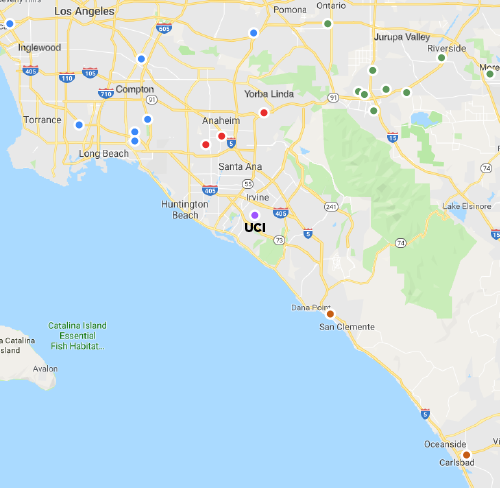 A vanpool consists of a group of 5 to 8 commuters with a similar work schedule who lease a vehicle through the contracted vanpool vendor and commute together from a designated departure site to the UCI campus. A vanpool must have at least one approved driver, one approved alternate driver, and a minimum of 5 riders to get started. Vanpools are driven by members of the vanpool group. All vanpools are required to be American with Disabilities (ADA) compliant. Accessible vehicles are available upon request. How do I become an approved driver? To become a driver, you must complete an application through “Commute with Enterprise” and OC Vanpool. You must be a least 25 years of age with a good driving record to be approved. Do all drivers get a key to the vehicle? “Commute with Enterprise” provides two keys per vehicle. It’s up to the drivers to share as needed. Lock boxes are available for each vehicle upon request by the Vanpool Coordinator at no cost. What is a Vanpool Coordinator? Each vanpool must have one coordinator. This person may be a driver or member of the group who is responsible for reporting ridership and fuel expenses to OCTA to maintain the monthly federal $400 subsidy. The coordinator works directly with "Commute with Enterprise" to scheduled routine maintenance every 6,000 miles. The Vanpool Coordinator is the keeper of the vehicle’s fuel card. How do I find riders for my vehicle? There are many tools available to help you recruit riders for your group. The best way to recruit new riders is for each vanpool member to reach out to co-workers. You may also use OCTA’s online ride-matching service ridematch.info. UCI has partnered with Waze Carpool and Zimride for even more potential matches. The sustainable transportation team assists to recruit new riders through targeted emails and can check if there are any potential riders on the waitlist. Who pays Toll Road charges incurred by our group? Each vehicle may decide to use the available toll roads. If the group decides to use the toll roads, one member of the group must set up an account, collect charges from the group, and facilitate payments. What do I do with my current parking permit? If you currently have a parking permit and are joining a vanpool, you will need to return your parking pass to be able to receive Sustainable Transportation benefits such as the monthly occasional use permits. It must be returned to transportation services so that you are no longer charged for it. If you were carpooling, your carpool permit must be returned. How do I get occasional parking permits if I have to drive myself to campus? All vanpoolers are eligible to enroll in the Sustainable Transportation Program where you will receive an allotment of occasional parking permits to use when needed. Visit myCommute, log in using your UCInetID, and create your ST account. What do I do if I am sick and need to go home early? Once enrolled in the sustainable transportation program, you will also be eligible for the Guaranteed Ride Home Program. This service is available twice per fiscal year and provides you with a complimentary taxi ride home if you need to leave early because of illness, an emergency, or unexpected overtime. Pre-authorization is required. To use the service, call sustainable transportation at (949) 824-7433. Can I take the van to lunch or an off-campus appointment? Only approved drivers may use the “Commute with Enterprise” vehicles for personal use. Most vehicles have extra mileage built into their lease cost to cover personal use as long as it does not exceed the monthly allotted mileage (varies by vehicle). In an emergency after normal business hours, the vanpool driver and/or coordinator should call Enterprise’s maintenance roadside assistance and accidents at (310) 436-2375 or (800) 826-4967 ext. 4, or email maintenance@vanpool.com. They will coordinate repairs or arrange replacement transportation if needed. If I have an extended leave of absence, can I get my seat back on the vehicle? In order to hold your seat if you take any type of leave of absence, including being off over the summer, you must continue to pay. If you choose not to pay your seat may be filled while you are gone and unavailable upon your return. Â You must notify Sustainable Transportation if you want to stop being billed for vanpooling. Adjustments will not be made after your return. How do I leave the vanpool program? You must contact Sustainable Transportation in writing of your intent to leave the vehicle with a minimum of 30 days’ notice to stop your payroll deductions or billing. Please also contact your vanpool coordinator and/or driver so that they have an opportunity to recruit a replacement for your empty seat.